Getting by car from Malaga airport to any of the resorts of the western Costa del Sol, there are basically two ways of travelling the Mediterranean Motorway, either along its toll free motorway (A-7) or the toll road (AP-7). We´ll have a look at advantages and disadvantages of both, as well as prices depending on season. The Mediterranean motorway AP-7 (E-15) in the province of Malaga has a length of 105 km and consists of two segments: Malaga-Estepona and Estepona-Guadiaro. This toll road runs almost parallel to the old coastal road N-340 and A-7. The A-7 is a very busy highway and with high density, due to the fact of being located directly on the coast and linking all coastal municipalities. Since in many sections the A-7 is actually the old national road, there are many areas with just two lanes and narrow curves that force to slow down to 80 km / h.
Another major drawback is the driving quality; there are numerous exits from housing developments with a very short or no acceleration lane, and often the driver of the right lane is forced to sudden braking due to reckless incorporations. This applies especially to the section between Fuengirola and Marbella which we personally don´t consider a very relaxing stretch to drive; while the section Estepona – Guadiaro has a large number of roundabouts and also presents sections with limitations in speed of 80 km / h.
In the AP-7 obviously these disadvantages do not exist. The driver can enjoy a much more fluid and pleasant journey to the Costa del Sol municipalities. However, both by distance and by travel time, there is no significant difference between the two motorways. On the other hand, stress-free travel and without congestions on the AP-7 has its price which varies considerably depending on the season and leads many drivers to continue opting for the A-7; especially in summer it is completely saturated by a huge number of vehicles. In the AP-7 apply two types of rates: The normal rate is applied in the months of October to May, except Easter; the special rate is applied in the months of June, July, August and September and Easter. As you can see, the more expensive section is towards Marbella; this toll road begins before reaching Fuengirola and has a length of 30 km. This section is the one that corresponds on the A-7 / N-340 to the most difficult and congested stretch on the Costa del Sol. So, although a somewhat higher disbursement in summer, if you prefer a stress-free driving, we recommend taking during high season the AP-7 towards Marbella. After this popular municipality begins to de-congest traffic a little more towards the western Costa del Sol and especially after Estepona the landscape begins to be more scenic, with sections of the old N-340 travelling along the sea and less housing Developments to give your eyes a treat with the landscape and the nearby Rock of Gibraltar. Hi Simon, unfortunately the special prices apply from 12th to 28th of April. After spending a week near Malaga, we will be driving back to Barcelona. We leave on Saturday 1st June, and don’t need to be in Barcelona until sometime on Tuesday 4th June, giving us 3 days and nights. We will already have stayed near Benidorm for a week and visited the surrounding area, plus had day excursions from our cruise, to Alicante and Valencia. We would like to stop overnight in 3 smaller places, and if possible, have a scenic route to drive. It’s difficult to chose as we don’t know the roads, driving times etc. Do you have any suggestions please? You must leave Malaga heading to Granada following the A-45 until you merge into A-92M, that 20 minutes later merges into A-92. – Benalúa / Guadix: You can stay in a cave house, visit Guadix and taste a lot delicious of tapas, they are really cheap! – Alhama de Granada: Amazing views, there is an easy trekking route with lovely sights, you can also stay in a cave house and there is even a natural thermal baths (there is a free area and a paid one included if you stay in the hotel). *Benalúa/Guadix is nearer to the route you must follow, but Alahama is worth a visit. 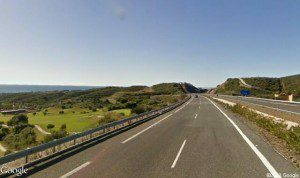 – Cabo de Gata: Take again the A-92 to Almeria. On your way to Cabo de Gata, you can spend the day in the Oasys MiniHollywood theme park, near Tabernas. It’s a Western town, like you see in the movies (in fact, many Western films were set here). If you prefer a more relaxing plan, you can go to any of the small beach coves you can find in the coast of Cabo de Gata. 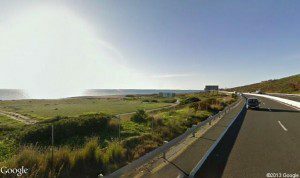 – Manga del Mar menor: You have to take the A7, following the coast. The place has an amazing beach, part of a seaside spit of Mar Menor in Murcia (you can visit both sides, on the inside the water is really warm!). Very touristic area though. Then you still have about 6-7 hours drive to Barcelona via AP-7. If you think it’s too much, you can skip any of the previous steps and spend a night in Calp or Denia (although you have probably visited those towns). Thank you very much for taking the time to write such a comprehensive reply. I really appreciate it, and will now check maps and town info to finalise our plans. Hi I am wondering about how busy the A-7 is in November when the tourist season has slowed down . Is it still super dangerous like it sounds?? We would love to bicycle tour along it to Cadiz. Thanks! The only downside is that in some municipalities bikes are forbidden on weekends, and also on weekdays between 11am and 6pm. Biking in the A-7 is forbidden and is really dangerous. t seem to find the info on the times that bikes may be able to ride the path but will try to get some more info on this. Thanks so much for your time and effort! cheers! Hi – We will be hiring a car in Barcelona in May 2019 and driving down the coast to Mijas (but overnight stops along the way). 1. How much should we expect to pay in tolls. (A Green card is recommended but not compulsory for vehicles from other EU countries. Within the EU, any vehicle insurance policy automatically includes third party cover throughout the European Union). •	Two hazard warning triangles to be used in the event of immobilization of the vehicle at the roadside. •	A high-visibility waistcoat for driver and each passenger, to be put on in the event of breakdown or immobilization. I know our car won’t be from a foreign country, but do car hire companies provide these items and are they likely to charge extra for them? and is the insurance we take out with the hire company sufficient? Regardless if the car is foreign or national, is required the insurance policy (Green card for foreigners), the warning triangles and a high visibility waistcoat. The rental cars are usually equipped with triangles and visibility waistcoat and these are free of charge. Regarding the insurance, these depend on each hire company. We at Malagacar.com have for example an extra insurance that covers you fully, as the standard plain insurance that comes with the car, does not cover many aspects. If you want to travel with peace of mind, I would opt for the equivalent full insurance of the car rental of your choice. Kind regards & have a lovely trip! Thank you for your help, much appreciated. We will want to stop on the way for lunch, can we eat at a service station? Hi Carol, most of them have at least a small coffe shop, but they usually serve breakfasts, sandwiches, doughnuts, etc. We are travelling from Malaga airport to Estepona this summer, the plan is to take the toll road. Are there any service stations along the way/places to take a break? Don’t worry, there are several petrol stations along the way. Anyway, it won’t take you more than 45 minutes to get to Estepona using the toll road. Thank you that’s great. Do the petrol stations have toilet facilities too? Hi,I may be going to Gibraltar using the AP7.I have a car hired from yourselves,do I pay cash at the tolls or is it charged to the car rental. Hi Thomas, you pay at the tolls. Good day, My name is Jeffrey. I will be in Malaga, arriving at the Renfe AVE station on May 25th, 2017 with my wife & cousin. We would like the cost of a car rental from May 25 until May 31st, and to leave the car at the Malaga airport around 8 am. We will be driving from Malaga to Tarifa to get to Tangiers on Friday May 26 or Saturday May 27th. Van you tell me if those days are good for the ferry, which day is better. For a quote please go directly to our main page https://www.malagacar.com/uk/car-hire/quote.php and fill in the required dates/times and car group. We have furthermore different hire options so we cannot respond you this generic question without further hire details. To give you an idea, the Basic price for the cheapest car groups is around 120 € for these dates, to which you have to add fuel and extra insurance or otherwise 1000 e deposit. We are driving from Malaga to Granada in early April, and then to Benalmadena on the same day (at 6-7pm). Visiting from UK and with little experience of driving on the right what would your recommendation be regarding choice of roads plus any other useful advice. The motorways are quite easy and comfortable to travel, yet the cities are more complicated, especially Granada, as the centre is restricted to traffic and many roads are very narrow, apart from elevated traffic. We´d thus recommend travelling from and the Costa del Sol on the motorway A-45 (or toll motorway AP-46) and then A-92. In Granada city we´d recommend parking in a public parking, it will save you a lot of hassle. Please find attached a link with information to all public parking in the city centre. 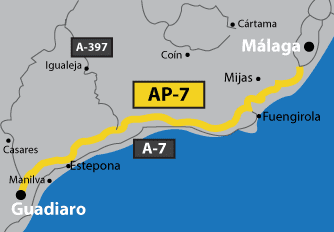 Hi, please can someone give me directions from Estepona to Malaga airport and back via the AP7 toll road. We are making some “how to get to” articles with easy instructions. We will try to make the one for Estepona as soon as possible. Can tolls be paid using VISA? Hi Kim, yes, tolls can be paid with Visa card, no problem. Kind regards! I see road work going on at the A7P around the Altos de Marbella service station. Are they making an exit there? It is right by the hospital and I hear a new motocross bike track? Hello Mike! By now we cannot tell you what the road work is about, as we couldn’t find any related notice; yet about the planned moto cross circuit, the mayor of Marbella, José Bernal, has nullified by decree the circuit construction project due to many protests of the neighbours. Thanks for that info on the circuit. I am a regular visitor to Los Altos de Los Monteros and was wondering if the people there would have complained. It would have been good to have a facility for motocross though. Another location perhaps in the future. Thank you Mike, you are most welcome! As far as we understood, it’s a resident’s area and of course they prefer to have some peace and not the sound of motorbikes in the closeby hills ;). Ps. Please remember to book with your client login in combination with the discount code HELLOFAN. Please find attached a link to the official web page of the AP-7. The fare for your required section is 9.70 € in low season and 15.75 € in high season. – from Airport to the resort? – from resort to Tarifa? – from resort to Seville? – from Seville to Tarifa? – would AP7,AP4 and AP46 the only toll roads we will be using for the above trips? your advises would be greatly appreciated. Miraflores Beach and Country Club Resort is situated in Mijas Costa. –	From the airport to the resort in Mijas you can skip the toll by staying along the A-7 / N.340. These are the only toll roads. Kind regards! We will be driving a motorhome through France and into Spain,later this year. Our final destination is South of Estepona. We had intended to drive the coastal road ( A7) through Spain, however”we’ve read some distrubing reports of ” carjacking” and distraction thefts on the A7. These incidents seem to be more prevalant around Barcelona. Is there an alternative route we can take that avoids going near Barcelona? Basically there are two main routes to the south, one along the A-7 (Autovía del Mediterráneo) passing by Barcelona and the other along The E-5 /E-902 (Autovía del Sur) passing by Madrid. It´s true there are many reports about deliberate puncturing of the tyre, which is usually done by a motorcyclist when the car is stopped at traffic lights, followed by a distraction theft. Yet these usually happen in town and the car has to stop at a traffic light for instance. Thus the easiest way to circumvent this is to stay directly on the AP-7 (toll motorway) and just pass by Barcelona. Please find attached a link to Google Maps. Kind regards! I have gone thru’ this excellent article. Can you also guide us in travel from Barcelona. We are four of a family and will be travelling from Barcelona to Alicante (halt for one night) to Malaga (or Granada, we are yet to decide). We are from India and accustomed to driving on left hand side, hence which will be easier route? Hello Sanjay, thank you very much for your feedback! The full route from Barcelona to Malaga is a bit over 1000 km. We have attached a couple of links to Google maps where you can view it. You stay mainly on the AP-7/ E-15 (toll road) until Puerto Lumbreras, from where you will take the national motorway to Granada which partly becomes national road. From Granada to Malaga you drive again on the motorway. You can either travel the same route as above or take the coastal route via Almeria and stay all the way on the E-15; this route is slightly longer(about 30 km to Malaga) but it might be easier for you to travel as you just have to keep driving on the same Highway. We hope this information is useful for you, best regards & have a good trip! Thanks for this article, very useful. Can you tell me a bit about the hills on this route please. I would like to book a holiday to stay in Estepona but the person I am travelling with, who will be driving, has really very bad fear of heights to the point where he can’t drive along a road that has a drop off on one side even if he’s not in the lane next to the drop. He looked at the map and saw the AP-7 and A-7 run through mountain areas and has said it will not work for him. Please can you tell me whether these roads are flat with no drops? Taking into account your description, it will not be possible for your friend to drive along the AP-7, as there are several strips running through mountainous area (with fantastic views, by the way). So the only possibility for him would be driving along the old national road N-340 with runs along the coast (partly the A-7). Otherwise you could use public transport or a private transfer. we are going to La Cala golf resort in July for three weeks and hiring a car from you – i have read some really disturbing things about how dangerous the A7 road is – i have a fear of motorways in britain and this sounds so much worse!!! I’ve also heard that the toll road is also very dangerous because everyone drives so fast on them. our son in law is receiving the car from you from malaga airpot and my husband and i are arriving at malaga train station – what is the safest thing for us to do as we will have 2 small children with us? do we get a taxi, or a train to Fuengirola and then a taxi – if we do the latter do we miss the most dangerous part of the A7? will a taxi driver take the toll road if we ask and pay for it? I am very stressed and now wanting to cancel my holiday – please help!! Don’t worry, you have nothing to fear about. It’s true that there are some accident blackspots through the A7, but since maximum speed was reduced to 80 km/h accidents are much less common (and much less serious too). On the other way, the AP7 is a very secure toll road. It is in perfect condition, just stay on the right lane and drive around 80-110 km/h. The good side is that La Cala Golf Resort is located near the start of the A7 ‘bad part’, so you will only have to drive through it during 3-5 minutes. In your case, taking the AP7 toll is not really useful, because the first exit is a too far, so you would have to get into the A7 again to get back. 2.- Travel with you son in law (you will need to carry/hire the appropriate seats for your children). 3.- I would discard the train/taxi option, I’m not pretty sure that public taxis can provide 2 child seats. Hi Sandra, well, the road between La Cala Beach and the Golf Resort is smaller, it only has 1 lane per direction (A7 has 3 lanes per direction until the exit of Miramar-Fuengirola, then it has a 2 lanes per direction). PS: Bringing/hiring a GPS wouldn’t be a bad idea, although once you get there for the first time you will know how to get back again without problems. About public transport: You can always get a taxi to get back to the hotel (you won’t find any buses during the night). Hi! My sister and I will be going to Spain in 2 weeks (beginning of November) and would like to rent a car to drive along the Mediterranean Sea. I am looking for information about which road (AP7 vs A7) for the best views. We are from the inland US and would really like to see as much coast as possible. Although the AP7 with its tolls and less stress is tempting, I’m wondering if the views are very good from there? If we are looking for a drive with great views of the sea, would it be better for us to drive A7? Thank you very much for any info you can give! Well, the A7 runs along the coast, so you will enjoy some nice views from there, on the other hand, it can be stressful sometimes and dangerous in some points. There are also some speed radars on this road, so please do not exceed the limit of 80 km/h. The AP7 also provides some nice inland landscapes from a higher perspective and a more pleasant driving. I would choose the AP7 for the first trip, and then would take the A7 for the return trip (so you would drive on the lane closest to the coast). Always use Malagacar.com and wouldn`t use another company as they are always punctual with airport pick up and their staff are always friendly and effecient and speak very good english. Their cars are clean new and beautifully maintained. You have highlighted the single journey tolls – but most journeys are return. Thus the cost of a return trip from the airport to Marbella is almost 15 euro ! Very few people will pay this on a regular basis. The AP-7 is grossly underutilised. The A-7 is over-used and at times dangerous, with the consequent cost in journey times, pollution and the high cost of any accidents. I suggest organisations like Malagacar should campaign strongly for the tolls to be reduced at all times of the year. The summer increase simply exploits tourists. In the end, if many more people were to use the AP-7, the total toll revenue might actually increase !